Like many busy families, the Middhas are often running in five different directions. Fortunately, there’s a place where they can all come together: The Greater Midland Tennis Center. The facility is the largest tennis center in the Midwest and one of the largest in the nation. More than 2,000 members enjoy playing on 40 indoor and outdoor courts throughout the year. Our Tennis Center is just one of the many Greater Midland locations where families of all shapes and sizes love spending time together. In fact, a recent survey showed 78 percent of member families feel a sense of belonging at Greater Midland. “We know that when families feel like they’re part of a greater community that it improves their health, motivation and happiness. That’s what we work for each and every day,” said Tennis Center Executive Director Scott Mitchell. The Middhas say the Tennis Center is at the heart of their active family. 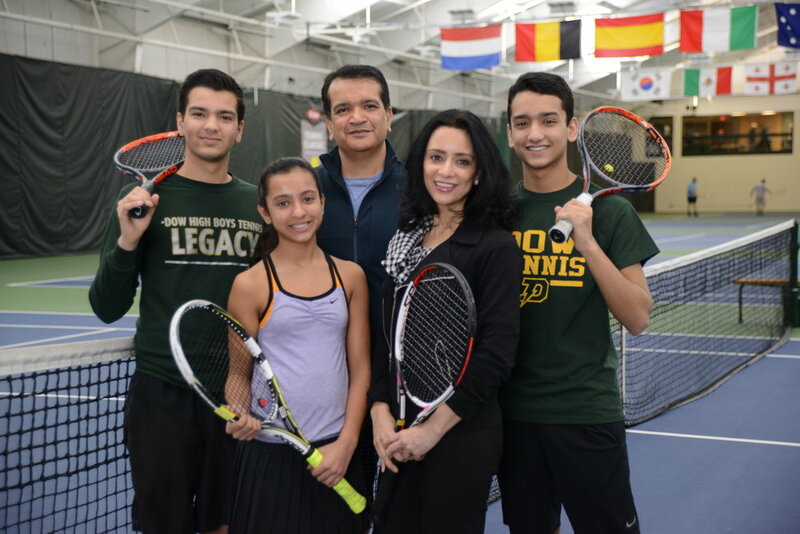 Ajay and his wife, Madhu Rishi, both Midland physical therapists, play tennis as often as possible and their three children have grown into outstanding players. Aditya, a senior at H.H. Dow High School, was the No. 1 doubles state champion and a finalist twice in the state championship; Anish, 15, also plays for Dow High, has been ranked in the Top 15 in the USTA Midwest, and won a Nationals tournament. “Anish has a banner at the Tennis Center and it makes me smile with pride every time I walk in there,” Madhu said. Their daughter, 11-year-old Ayesha, just began playing competitive tennis and won the West Draw of Midwest Closed 10 and under. “The Tennis Center does a great job in providing a 'home' for all of us families in the community who love tennis as a recreational or competitive sport,” Ajay said.